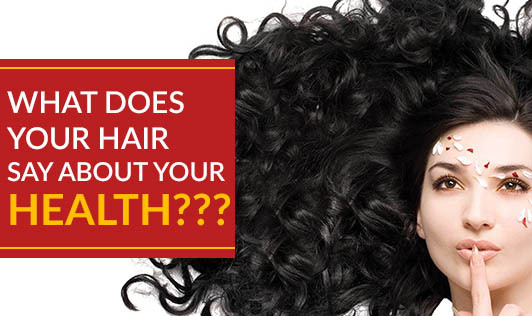 What does your hair say about your health??? • Dry hair can be because of a variety of reasons like use of hair dyes, overuse of hair blowers, hair straightners or even chlorinated water. But if the texture of your hair changes, it indicates an under active thyroid gland. Hair appears thin as they become weaker but the thickness remains the same. Consult your Doctor for the same. • Thick flaky crust on your scalp, different from dandruff can be an indication of psoriasis. Using shampoos that contain zinc, salicylic acid and Aloe Vera can be the best solution for the same. But it is better to consult your Dermatologist to know which shampoo suits your condition. • Are you shedding more than 100-150hair strands every day, it could be due to stress (physical/psychological). A more common cause could be an infection or flu. Birth control pills, anti-depressants or even hormonal changes like PCOD can also trigger hair fall. • Brittle hair leads to breakage of hair. Your hair can become brittle due to excessive use of chemicals or even due to certain diseases like Cushing's syndrome, hypothyroidism or low levels of calcium, phosphorus and omega-3-fatty acids. • Dandruff, itchy scalp and flaky skin are due to the growth of yeast and fungus. This flares up in winter and disappears in summer. Visit your Dermatologist and get it cleared.